Website Search Engine Optimization, aka, SEO, it's essential to get your website indexed in all the major search engines, increase your search engine rankings and more traffic. SEO is best applied as a web design is created. SEO starts with basic on-page search optimization, determine specific relevant keywords also title and description. to your website. Off-page search engine optimization, may be, social media optimization, article or content writing and article submission, Twitter, Facebook, Bing and MySpace promotions, Local directory submission or yellow pages, ..., and monitor results. Internet Online Marketing, get more traffic and business leads by optimizing your website for less then paying to advertise. Did you know that 87% of all website traffic comes from Search Engines? Want more traffic? All websites require Search Engine Optimization (SEO). Website SEO is simple for local areas verses global SEO, which can be more costly. Regardless, in order to do good business online all websites need SEO, to what extent is each individual willing to go. Optimizers usually charge a monthly fee for each key word optimized. SEO main goal is our client's website pops up in the top spot of search engines, as quickly as possible. Our Search Engine Optimization increases exposure in search engines, drives targeted internet traffic to clients and increases business leads. The most experienced optimizers may take hours, days, weeks even months to achieve a top search engine position depending on the popularity of the key word or phrase optimizing. Popular key words or phrases take longer and will cost more because more work is required. Once your website link is on the first page or near the top, monitoring is suggested, as position may change. SEO should be a never ending responsibility of any business. There are many parts to SEO, as you see below. How far should you go, how much do you want to spend and how long will SEO take to start bring traffic and business leads? These are good questions that cannot be answered truthfully without analyzing a website, even then, time, patience and trusting your SEO is necessary. With proper SEO you will not have to pay to advertise in the future. Presently most of the internet traffic you receive comes directly from places where you may advertise or by giving out you web address. Currently your web address is like an unlisted phone number. Without advertising only a few find your website without knowing the correct address or knowing you personally. 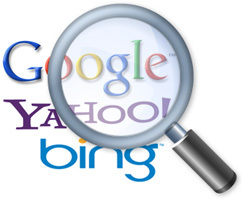 Done properly, optimizing your website to the search engines gets you listed! Remember that 87% of all website traffic comes from Search Engines? We provide this service because we feel it is very important for your website to be listed in the search engines, on the 1st page and at the top. We are qualified and proficient at SEO. We are eager to start optimization your website. Our SEO specialists are available 6 days a week. Call us — (541) 476-2105 — or e-mail us today!